faceless book: What is common between procrastination and the Mancs? 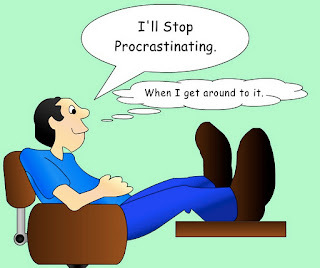 What is common between procrastination and the Mancs? I was going to start another round of web browsing. After all, there are so many things I have achieved today that I felt I could spoil myself a little. But then I remembered my commitment to taking on procrastination. The checking of the score of the match between Liverpool and our archrivals the Mancs can wait. We are so prone to give ourselves easy excuses to push back something we are supposed to do – excuses in which we make ourselves believe that we will get to the task after just a few minutes of doing something else, usually something which gives us instant gratification. The unfortunate fact is that what is meant to just take up a few minutes usually end up lasting a long time, and by the time it finishes, we either have pushed the original task to the back of our mind or have so exhausted our energy or motivation on that other engagement that we will not do the original task any more. Procrastination, like the Mancs, is a formidable rival, but one that we have to try to beat at all costs. Now what's the final score?